Unlike most of my peers, I never took photography in high school. I think I was too busy treking off campus for Spanish class. Not a high priority in any event. I took an intro art class instead that involved fewer paint smudges than I had secretly hoped for. Truth be told, I'm not great at creating art. A class about photo composition and film development techniques would not have helped much. However, in an attempt to fill college credits with something fun (and cut down on book expenses since my roommate had already taken it), I ended up in a history of photography class my last year at the UW. In theory there are many topics on which I could wax poetic after four years of higher learning. Mexican agrarian reform, cellular mitosis, comma splicing, the moral ramifications of surrogacy, etc., etc. Seriously, I would love to see exactly how much information I've committed to memory only to forget shortly afterward. Preferably the data could be bound in encyclopedic form. I digress. So the point is I don't remember everything I learned in History of Photography but on occasion I do feel I am able to appreciate pictures on a deeper level. However, usually I just get stuck in awe. I can't remember which airport it is. I think it's O'Hare. I really want it to be O'Hare. The other option is LAX and I was through that airport enough as a kid for it to be plausible. 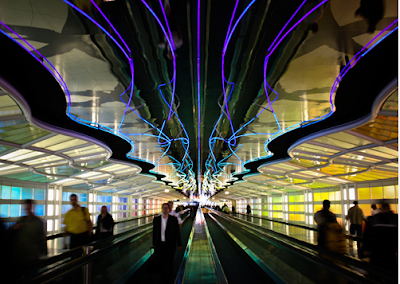 Additionally, I've been through various hallways and corridors in O'Hare and haven't seen these lights recently. But. I remember this as O'Hare. There also used to be one of those huge coin tornadoes at O'Hare. Seriously, these were the sorts of things that remain the highlights of past vacations regardless of destination. Anyway, that's a photograph by Thomas Conrad. Everything else aside, he takes some really awesome pictures. They remind me of Azure Ray songs, cigarettes, and sea salt. I remember this being O'Hare too... like as a child back when you could like GO to gates... and my mom would get us sooooooooooo lost. For serious, ALL trips to O'Hare with mom as a child lasted at least 4 hours. The fact that we can only pick people up @ baggage claim may be the only good thing that came out of 9/11.